Home » Ethics » Do You Have Enough? In his new book Enough, Will Davis Jr attempts to explain this tricky concept. He writes as a friend, pastor and teacher all at once, making his words both easy to hear and hard hitting. Backing every point up with scripture and an entertaining anecdote, Will holds the reader’s attention beautifully. While he is aiming is book at the average evangelical American, the vast majority of Will's ideas translate to British culture. His examples tend to apply to married couples with children and a stable income more than any other demographic. Will’s big idea is that most Christians have more than enough. While this isn’t necessarily a bad state to live in, it often is. Christians should therefore be looking to bless others with what they have, being generous both for other people's benefit but also their own. 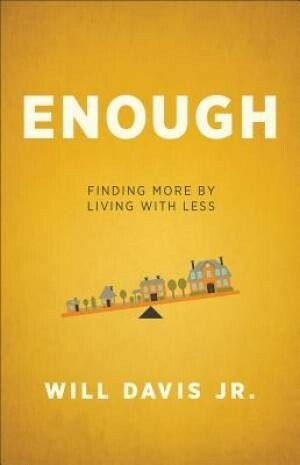 Beginning by laying out the benefits of living with enough as opposed to more than enough, Will’s aim is to help the reader enjoy life, not strip them of nice things. In the second chapter The Oldest Trick In The Book, Will explains how even in Eden, Satan’s tactic was to attack people's sense of contentment. Everyone knows that having more money and possessions won’t bring you happiness. The problem is that according to Will, many Christians live as if they do. His book helps readers reassess their priorities and take small but important practical steps to living with enough. Every chapter ends with ideas and Bible verses for further reflection. It's refreshing to find a book on money jam-packed with pointers on how to cut back and move away from a lifestyle driven by consumerism. Without these ideas, the book would be in danger of coming across as preachy or worse; depressing. The ideas contained are thought provoking and interesting, for example Will suggests setting aside one day a year to throw away any item that hasn’t been used in the past 12 months. Writing with an obvious passion and drive it's unsuprising to discover that the book has come out of Will's personal experience. It was his trip to Mexico (“In short, I got ambushed”) that made the church leader realise how rich he was. Learning that anyone with an annual income of $20,000 (£12,300) or more is among the richest 11% of people in the world shocked Will. His first hand experience of poverty had such an impact on the author that he now recommends every Christian experiences poverty as this can help nurture an attitude of contentment. Using scripture to highlight the dangers of having more than enough, Will argues being rich can often make you feel proud, entitled, create a false sense of security and distract you from what’s really important. He argues that materialism and financial prosperity is like smog that taints our spiritual life. So what’s the remedy? According to Will, it’s generosity. He believes greater generosity will not only benefit others but strengthen the individual’s spiritual condition. Again, pratical advice follows: Buy a car that isn’t a status symbol and value relationships over money - all the while trusting in God’s promise to provide for your every need. I'm aware of the irony of encouraging people to buy a book that tells them to buy less books. But out of all the titles on generosity, money, giving and poverty, I can't think of one that's either as solid in terms of biblical references, or that's as practical and helpful in making real changes that will have a lasting impact. Will Davis Jr has found the answers to these questions in the Bible and through his personal experience. In Enough, he shares his insights using humour, stories and hard hitting truths. It's enjoyable and challenging in equal measures. Our list of "needs" change every day, and make it difficult to measure contentment. Wouldn't it be refreshing to measure contentment by living a life of servanthood instead?